I had this idea a couple weeks ago, that I would write Damien Hirst a letter asking if he would send me one of his spot paintings so I could then use it as a ground for one of my own paintings. This reminded me of Rauschenberg’s erasing of a de Kooning drawing and how that always felt like this changing of the guard to me. That both Rauschenberg and de Kooning knew that abstract expressionism had peaked and was heading towards it’s decline. The thought came to me after reading a couple of reviews of his most recent endeavor to fill all the Gagosian Galleries across the world with his spot paintings. One night, while I was pondering this idea, my friend texted me that Damien Hirst had died due to digestive complications. I immediately thought, “well that screws up my whole plan!” It turns out that Damien did not die, as the source of that information came from an unreputable blog, but it made me think about how unrealistic my plan had been from the start. So, I decided that I’d make my own Hirst spot paintings. The New York Times review had explained the simple formula on how the paintings were made. “…smooth discs of color applied to white canvases in orderly grids at intervals equal to the diameter of the discs. The discs can be any color, except the colors can’t repeat on any given canvas (though they come extremely close), and the people making the paintings choose the colors.” The only rules I really payed any attention to was that I couldn’t repeat the same color twice, and I chose the colors. So, I painted a “Hirst” spot painting over one of my paintings. I kind of thought of it as a veil or shroud. 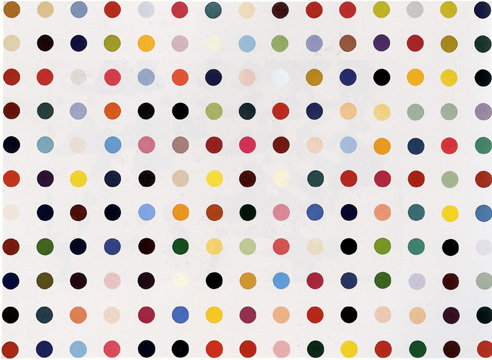 To me, Hirst’s paintings are symbolic of this untouchable, seemingly meaningless, rich art world that sometimes makes me feel jaded about contemporary art, and makes me question where I want to stand as a contemporary painter. The funny thing that happened though, was that I actually enjoyed making the spot painting. The pure formal task of filling in dots with my own colors was fun, and it served as an interruption to my usual painting practice which has allowed me to branch out some. Here it is in its current state. Strange new things are brewing. 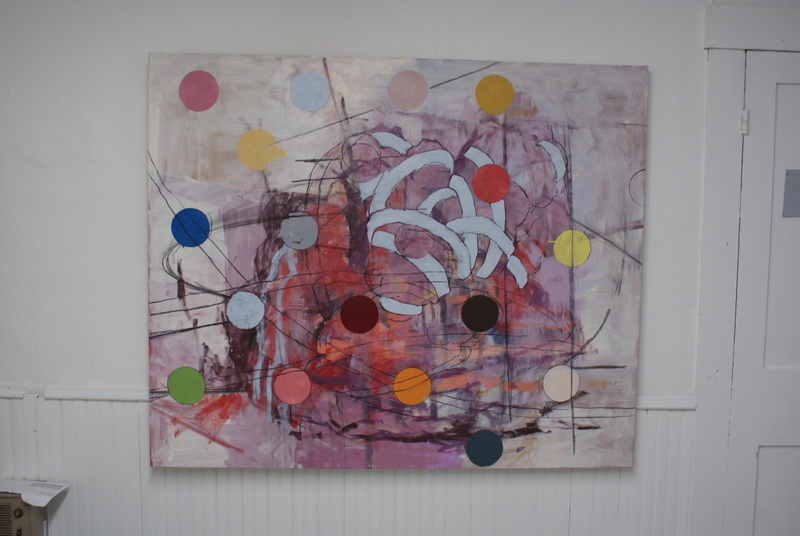 This entry was posted in art, Painting and tagged color, Damien Hirst, de Kooning, Disks, Formal, Gagosian Gallery, Henessy Youngman, Interuption, New York Times, Rauschenberg, Spot Paintings, Veil. Bookmark the permalink. I love your concept of Rausching Hirst. The painting you produced as a result is great- there is definitely something in the combination. Let’s see if he has the skill to Austin over a Hirst and make it work! I think you should write the letter anyway, as an exercise.